I have a ton of other product reviews that I should put up sooner than this one, but to be honest - I could not wait to get this review and comparison post up! 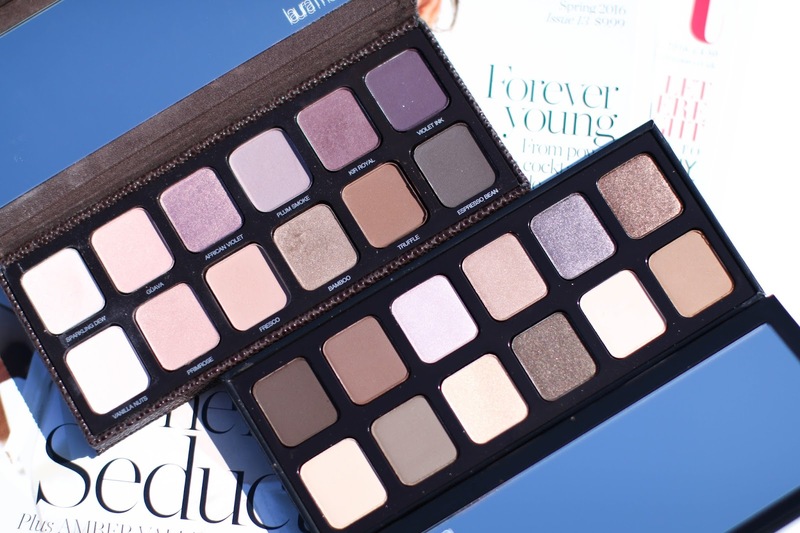 I am already a HUGE fan of the Laura Mercier Artist's palette and love all the shades, so I was thrilled to see them launch a similar palette called the Extreme Neutrals and it looked right up my neutral-loving alley. 1. 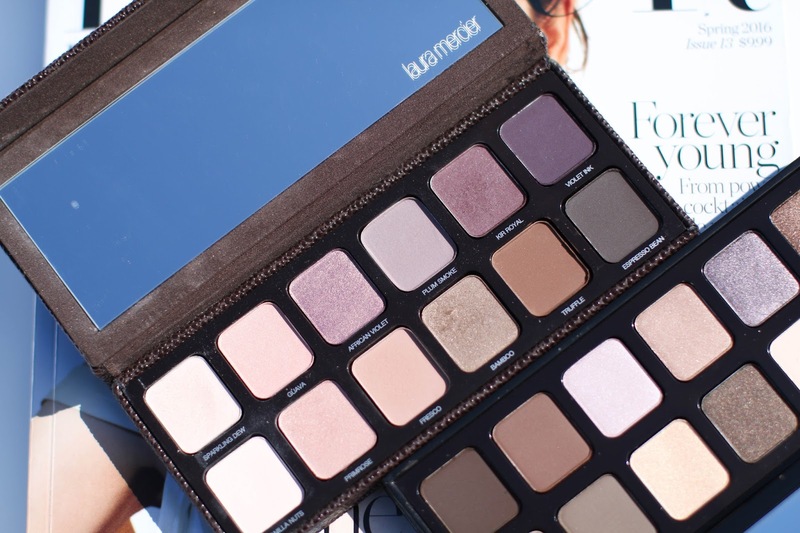 Laura Mercier Artist's Palette - If you already have this palette, you know it definitely skews more towards the plummy browns, rather than taupes or beiges. That being said, the pigmentation is so rich, creamy and buttery, that I find myself using it more than many of my other more brown shadows. There is a good mix of shimmer and mattes and it seems to match the Extreme Neutrals palette in terms of balance between the two finishes. 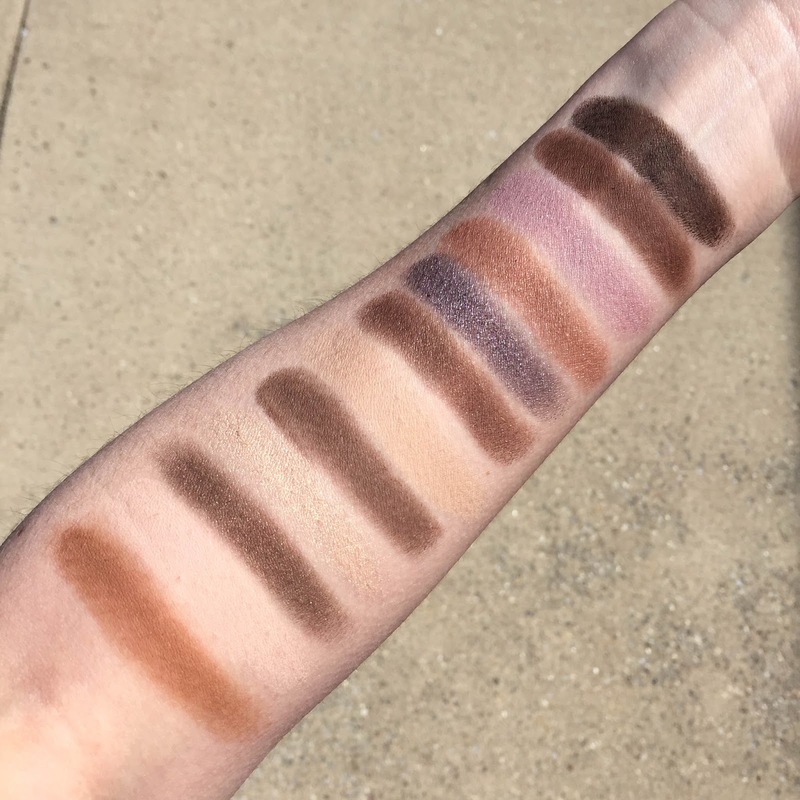 The above swatches needed only two swipes to get the intensity shown, whereas I found the Extreme Neutrals palette needed a few more swipes to get enough pigmentation for the photo. I love the Artist's palette because it has a good mix of bold and subtle shades, but I was longing for a few more silvery-taupey neutrals which I was happy to see in the newly launched palette. It's nice to have the names listed below each shade because they can be purchased separately from Laura Mercier if there is a color that is a favorite. I checked online and this palette is still available (it has been discontinued and relaunched a few times I've assumed from it's sporadic availability), and retails for a few dollars less expensive than the new Extreme Neutrals. 2. 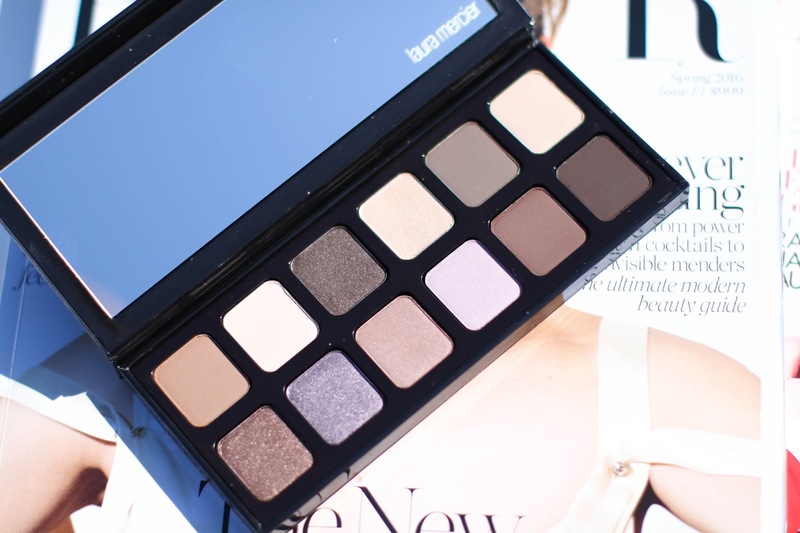 Laura Mercier Extreme Neutrals Palette - From a shade perspective, this palette appeals to me a bit more than the Artist's palette. 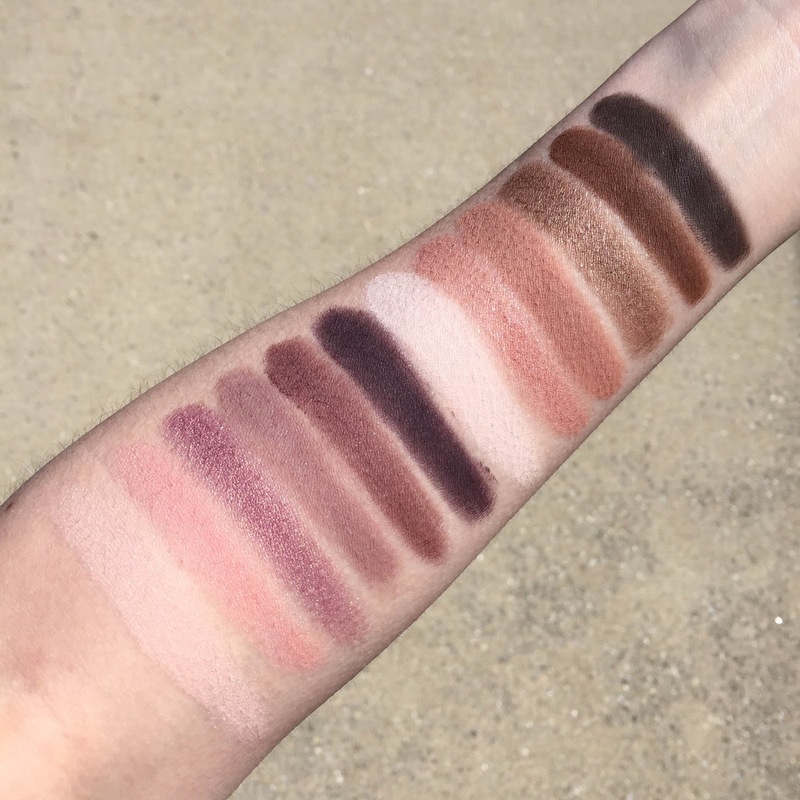 As I stated above, the pigmentation felt very different from an initial swatching standpoint, and I need to swipe the shadow 3-5 times to get the pigmentation as shown in the picture. However, while I felt a tad defeated during the swatch session, that soon changed when I used the palette and found the colors blended beautifully on the lid and showed up with just one swipe of the brush. The only shade that had a chunkier texture and was harder to apply was the fourth from the left of my arm - the pale gold color. The shade names are listed on the palette, but rather than being underneath each one, they are listed in order on the back of the packaging. As far as shade availability in singles, it looks like the colors in this palette are exclusive which can be a bit frustrating but nice that it's something different than what is traditionally available. It retails for a few dollars more than the Artist's palette, but I do find myself reaching for this one a tad more now. Either way, I think they are both beautiful palettes (the Extreme Neutrals is inching it's way over the Artist's palette slowly though) and ones that would satisfy neutral lovers. They are perfect for travel (I plan to bring one with me on my upcoming month long road trip! ), and the packaging seems to be sturdy enough to withstand any bouncing around. Have you picked up this palette? What are your thoughts on this or the Artist's palette?